Everyone knows Rolex. The Rolex crown stands for elegance and success and a time worn tradition that is reminiscent of Mercedes and Coco Chanel; timeless and never out of style. The fact is, once you own a Rolex, it is a watch you keep forever and it literally takes a licking and keeps on ticking (even though that isn’t the saying for Rolex, it works). I am a watch fanatic. I have been collecting watches since I was 18 years old, before I even knew the value or the difference between a Cartier and a Timex. To me, watches were just pretty. I worked at a pawnshop, and when someone sold something I liked, I bought it up. But, over time, I learned how to appreciate the intricacy of the movements, the differences of the shapes of the hands and how they sweep over the face. I learned to become a true collector, and through it all, Rolex is still my favorite. The Rolex GMT Master is one of the cornerstone watches of the Rolex kingdom. It was first created for Pan Am pilots so they could quickly check and know the different time zones while they were flying across the country. This was also the first watch to tell time in two different time zones. As the Rolex GMT Master evolved, the craftsmen at Rolex added a fourth hand and a rotating bezel that has a 24-hour marker. This is the only watch that has a ceramic bezel, which is scratch proof. Rolex doesn’t change much to the design of its watches over the years. After all if ain’t broke and all that jazz, but there are some minor improvements to the Rolex GMT Master II. The first improvement is that the numbers on the bezel are etched in with a patented nano-particle process so the paint is almost guaranteed not to fade or chip. The Rolex GMT Master II that I own is stainless, so the ceramic bezel is black with silver numbers. The stainless and gold has gold numbers and markers on the bezel. The sapphire crystal has an antireflective coating on it so you can see it from all angles, and there is a magnified date on the face. The clasp is an oyster lock clasp that is super easy to use and very secure. I love this watch, and out of all the Rolex styles, this is by far my favorite. What is this watch going to set you back? 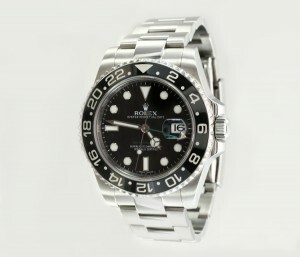 Brand new all stainless, around $8,450 and used around $6,500 – $7,500, depending on the various things, such as the year, whether the watch comes with the original papers and box, and whether you buy from a reputable seller. What is your watch of the week?